To find out how bad a natural disaster really is, many residents turn to social media, television screens, phone apps — and in some cases, their favorite Waffle House. With Hurricane Matthew approaching, Waffle House's Twitter announced Thursday that "All Waffle House restaurants on 1-95 between Titusville, Fla. and Fort Pierce, Fla. are closed. Stay safe Waffle Nation!" For diners, the announcement is a sign of the storm's severity, The Washington Post reported. @WaffleHouse @KFILE This means things just got really real. Waffle House establishments are located in areas that are vulnerable to hurricanes and tornadoes, which is why the company's business plan accounts for natural disasters. Pat Warner, the vice president of culture at Waffle House, told Marketplace last year that every employee has a hurricane playbook, which includes instructions on how to respond during a crisis. Restaurants also have emergency menus geared toward meals that can be whipped up quickly and efficiently. In recent years, the Waffle House in Norcross, Ga. has helped the Federal Emergency Management Agency provide refuge for evacuees. They work around-the-clock shifts, staying true to their 24/7 promise. 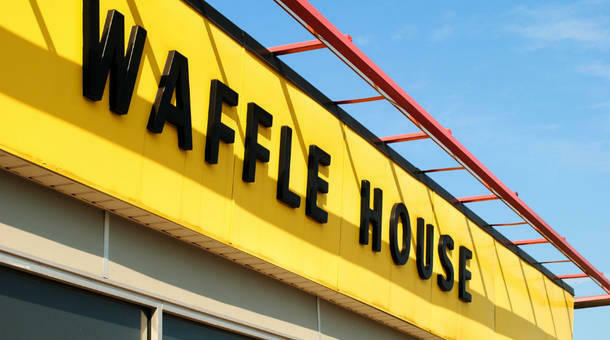 FEMA has even devised a "Waffle House Index" to help determine the weather's severity. "Green" means the restaurant is open, "yellow" means it's on a limited menu and "red" means it's closed. Using their system, the index is now on red alert. Hurricane Matthew — which some are calling the worst storm in 10 years — is hitting the southeast coast, including Florida, Georgia and the Carolinas. Even though Waffle House isn't immune this time around, the Post noted that the restaurant chain generally tries to reopen as quickly as possible. After Hurricane Irene, 21 out of 22 Waffle House restaurants across North Carolina, Virginia, Maryland and Delaware were up and running within days after losing power.